When we created Drink Your Carbs we assumed that ours was the first diet designed specifically for people who wanted to lose weight while continuing to drink alcohol. We were wrong by 150 years. The first drinker’s diet was published in 1863 under the title Letter on Corpulence, Addressed to the Public. The author was a British mortician named William Banting. The entire diet is less than 20 pages long. Actual advice for weight loss takes up less than two of those pages. 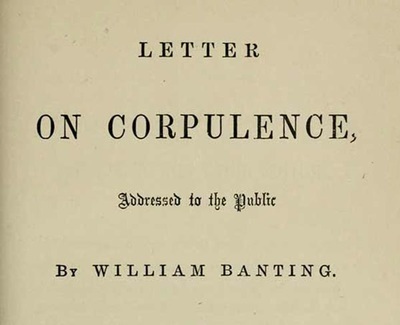 The rest of the letter is dedicated to Banting whining about his various physical ailments. Reading it feels a lot like visiting your grandfather in a rest home. Banting began his book in wonderfully overstated fashion. “Of all the parasites that affect humanity I do not know of, nor can I imagine, any more distressing than that of obesity,” he wrote. In 1863, these recommendations were considered radical. The medical establishment had a conniption and universally panned the diet as outright dangerous. Today, we can see the Banting recommendations for what they are, a relatively standard low-carb program. Banting pairs his food restrictions with a drinking regimen that would incapacitate most normal humans, including a cordial with breakfast, wine with lunch, wine with dinner and a nightcap of “[a] tumbler or grog - (gin, whisky, or brandy, without sugar) - or a glass or two of claret or sherry.” Not only did Banting create the first drinker’s diet, his “without sugar” requirement is unquestionably the original prototype of our No Mixers rule. The mere description of the quantity of alcohol Banting drank on a daily basis gives us a hangover. This is the reason Drink Your Carbs requires exercise. It would be virtually impossible to follow to the letter the Banting diet and still make it to your morning workout. This should be sufficient reason not to “Bant,” as the diet was referred to in its day. We agree with Time Magazine that Cameron’s pamphlet is filled with errors. Cameron lists wine as having no carbohydrates and Mint Juleps - a classic Southern cocktail that contains enough sugar to make a can of Dr. Pepper seem savory by comparison - as having only three. We take issue with the rest of the Time review. The review attempts to make the argument that alcohol consumption is incompatible with dieting. It minces no words. “The book’s contents are a cocktail of wishful thinking, a jigger of nonsense and a dash of sound advice.” We have spent years working to prove that this assertion is not true. 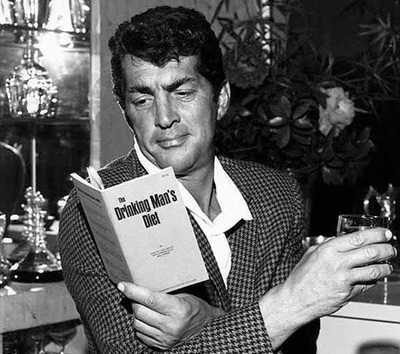 Aside from the mathematical errors, The Drinking Man’s Diet is impressive both for its simplicity and effectiveness. We have no doubt that if someone can really hold themselves to 60 grams of carbohydrates a day, they will lose weight. A limit of 60 grams of carbohydrates effectively removes all sugars and starches from a person’s diet. The result will be calorie restriction and weight loss, even without any recommendations for exercise. This is, of course, assuming that they don’t rely on Cameron’s fuzzy math for the carb counts. It is also worth noting that under the heading “Scientific Basis,” Cameron cites Banting’s weight loss as proof of the effectiveness of The Drinking Man’s Diet. It’s never a good sign when an author has to go back 101 years to dig up a success story. Fact: Citing Banting is odd, but it’s not the strangest thing in The Drinking Man’s Diet. That would be the recommendation that we all eat plenty of Raccoon, Opossum and Whale. (Odder still is the fact that he categorizes all three as “Poultry.”) We didn’t even bother to add Raccoon or Opossum to the Drink Your Carbs Food List. In this particular case, we agree with Mr. Cameron that roadkill should be unlimited. But being a decidedly less manly diet, we didn’t see the need to bring it up. While we agree that Opossum and Raccoon can be enjoyed in limitless quantities, we part ways with Cameron on the consumption of Whale. We have said this before and we stand by it: if it’s on the endangered species list it’s not on Drink Your Carbs. There is no exception to this rule. Until the U.S. Department of Fish and Wildlife removes all species of whales from the list, it’s off the menu. The most recent drinker’s diet, The Drunk Diet: How I Lost 40 Pounds . . . Wasted, was published in 2012. We noticed it, but we never picked up a copy because everything we read about it described it as a memoir rather than a diet. Every reviewer focused on the fact that the author, Lüc Carl, was an ex-boyfriend of Lady Gaga. And none of the reviews we saw bothered to mention that the book contained a serious diet and exercise plan. Until Carl reached out to us on Twitter, we assumed The Drunk Diet was a celebrity tell-all wrapped in a misleading but otherwise awesome title. ​Comparing The Drunk Diet to Drink Your Carbs is like comparing Hunter S. Thompson’s Fear and Loathing in Las Vegas to the Lonely Planet Guide to Las Vegas. Both books touch on local landmarks, but the similarities end there. The Drunk Diet is written for people who want to channel their inner Lindsay Lohan and party like rock stars. Drink Your Carbs is for people who enjoy ordering drinks with dinner and throwing back beers at a baseball game. While DYCers occasionally swallow instead of spit at a wine tasting, it’s rare to see us up past midnight. ​Fact: The Drunk Diet is a hard book to describe. Imagine throwing a traditional diet book into a blender along with Keith Richards’ new autobiography, a pair of tight leather pants and a shitload of hair-care products. The Drunk Diet reads like that smoothie would taste. 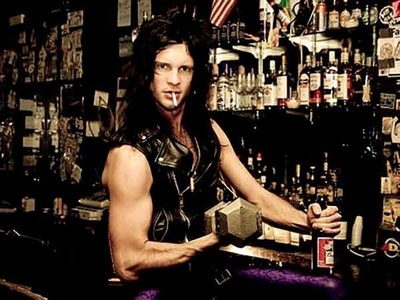 The Drunk Diet tells the story of Lüc Carl growing up in the Midwest, playing in heavy metal bands and hanging out with meth addicts. Carl’s drug of choice was alcohol in quantities that could be considered pretty much insane. He lived a self-described rock-and-roll lifestyle. He went out every night, got wasted and was lucky to make it all the way home before passing out. Toward the end of his 20s, he looked at his own body and discovered that he was fat, bloated and felt awful most of the time. Somewhere deep within his evolutionary programming a bell went off. He recognized that he stood at a personal crossroads. It was time to make a decision: clean himself up and balance his rock and roll dreams with a healthier lifestyle or die like Elvis, slumped over a toilet. The Drunk Diet is Carl’s story of getting healthy - not necessarily clean - along with the diet and exercise plan he developed along the way. Fact: We have a friend in New York City who played in a dozen different bands and, at one point, even opened for Nirvana. In her youth, she partied every night imitating the live-fast lifestyle of her rock heroes. These days, she is rapidly running out of friends. One by one, all of the people she performed and partied with overdosed and/or committed suicide. Like Carl, she cleaned up her act just in time. She managed to get out with few long-term negative consequences and a thousand great stories. We don’t share these dramatic turnarounds. We never rocked all that hard. Andrea tended bar for a while, but never fully committed to the lifestyle. Steven is a musician, but the ukulele just doesn’t lend itself to being smashed on stage. All we can say is that if our friend and Lüc Carl ever start a rock-and-roll Survivors Club, we hope we’re invited along to listen to them compare war stories. Carl also avoids salt and high-fat foods, including red meat and egg yolks. By contrast, we pretty much live on red meat and eggs, yolks included. And our enthusiasm for salt can only be compared to a deer loving up a saltlick. ​Fact: Our favorite rule in The Drunk Diet is that Carl will not purchase any foods containing ingredients he can’t pronounce. This effectively removes all processed food. Everyone should adopt this, unless, of course, you’re a food scientist who knows how to pronounce these words. In that case you should avoid purchasing foods that include ingredients that Carl can’t pronounce. Carl’s approved list of alcohol is as small as his pasta dinner in a Tupperware marked “Thursday” in his fridge. Carl drinks little, if any, beer. He orders wine only occasionally. He avoids mixers for the same reasons we do. His go-to cocktail is vodka, soda and lime. And he insists that bartenders mix it weak so that he can down them all night without getting too sloppy. This has to be the most difficult part of his routine. Carl is, among other things, a bartender. Bartenders don’t mix weak drinks for other bartenders. He doesn’t say how he pulls off his half-portion vodka sodas, but our guess is that he has to beg. We’ve had great runs in beautiful locations but we have yet to feel that level of euphoria. Carl does include music recommendations for running; at some point we may try running to his mix to see if that helps. Fact: We’ll be honest. We can’t evaluate Carl’s music list because we know nothing about heavy metal. Andrea grew up in a hippy household listening to classic 60s and 70s rock. Steven was a fan of punk and new wave, which, for reasons he can no longer recount, meant that he refused to listen to metal. To be fair, his friends who listened to metal felt the same way about his music. We have no doubt that The Drunk Diet works. If you follow Carl’s recommendations you’ll be eating small portions and exercising daily. You’ll be drinking far fewer calories than are allowed on Drink Your Carbs. According to Carl, “diet books are really a whole bunch of crap written by a whole bunch of assholes who think they know more about your body than you do.” ​We respectfully disagree. The Drunk Diet contains great information for the committed drinker who also wants to lose weight. It’s a very different path from Drink Your Carbs, but if your plans include throwing an amplifier off a fourth story balcony this book contains a lot of sound advice that Drink Your Carbs lacks.